Everything looks too grim for White. The game is actually lost. Two groups at the top and on the left are dead or almost dead. Black reigns in the center. White 1 intends to sacrifice two stones and finish here in sente. Black 2 takes the sacrifice. It is important: not because it is large but because otherwise White's stones on the fight would become very thick. But I believe that simply finishing off killing White's stones on the top was a sure win for Black. White 3 continues with the sacrifice hoping that Black would reply. 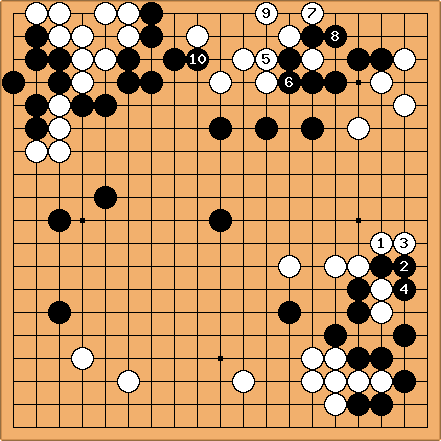 Then White will use sente to do something at the top. This hope is a part of the game. White gambles. Black 4 takes the two stones and White's sacrifice has worked. White 5 is an atari that gets some half eyes for the group at the top. Black 6 connects (another option was to capture a stone) and White makes one more atari with 7. Black pulls out with 8 and White 9 sets up another half eye. Now killing White may be a problem. Black comes with 10 and White could live with the next move, but encouraged by sudden improvement of the situation she chooses not to do so.